Alexa Posas is an 18 year old Senior at Roma High School from Roma, Texas where she is lead vocalist and lead violinist of the International and 4 time National Champion Mariachi Nuevo Santander. 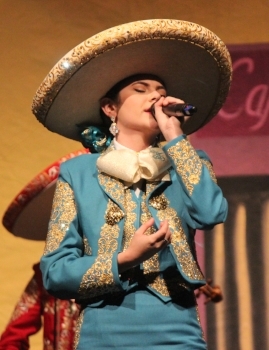 She has been awarded Best Mariachi Soprano twice and Best Mariachi Alto twice for the South Texas Region and took part in piloting Mariachi education in Nashville, Tennessee with Maestro Jose Hernandez of Mariachi Sol de Mexico. She has been a guest vocalist at the Houston Livestock Show and Rodeo twice as part of their Go Tejano Day’s festivities and was named BEST MARIACHI VOCALIST IN THE U.S. in November of 2015 by Mariachi Vargas de Tecalitlan. Since then, she has appeared in several magazine publications and TV shows like “The Texas Bucket List” and has opened concerts as a solo artist all over the United States for Mariachi Vargas de Tecalitlan and Ms. Vikki Carr. In February, she appeared on Mexico’s TV Azteca singing the National Anthem for a segment of “Mexico Bravo” filmed in South Texas. Upon graduation, she will attend the University of Texas Rio Grande Valley where she will major in Biomedical Sciences with a minor in music.